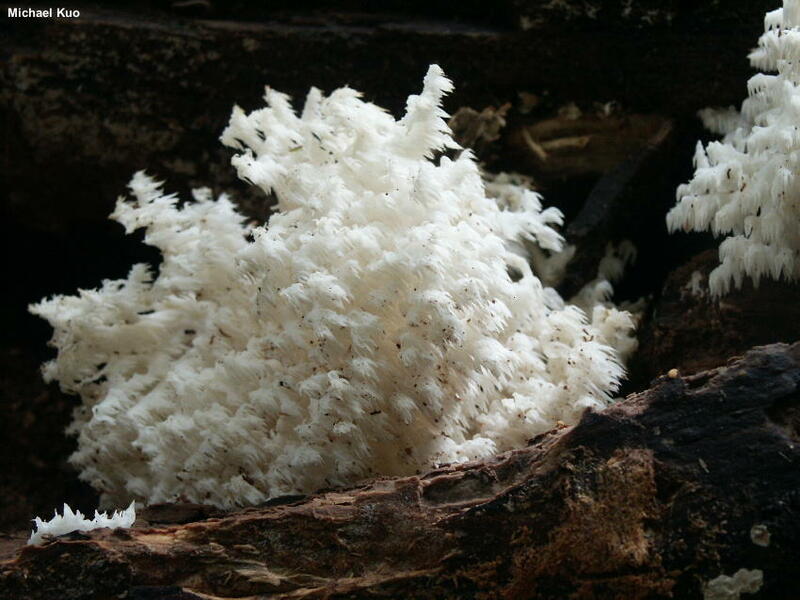 This delicately beautiful Hericium fruits from dead hardwood logs and stumps, sometimes in huge patches that can be seen from quite some distance. It is recognized by its short (mostly about 1 cm long) spines, and the fact that the spines hang in rows along delicate branches. Under the microscope it features very small, amyloid spores. 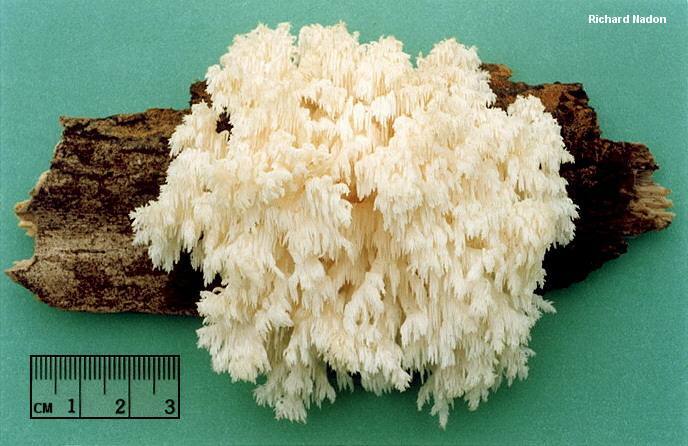 Hericium americanum is similar. It also hangs its spines from branches, but the spines are typically longer than 1 cm—and, under the microscope, its spores are substantially larger. 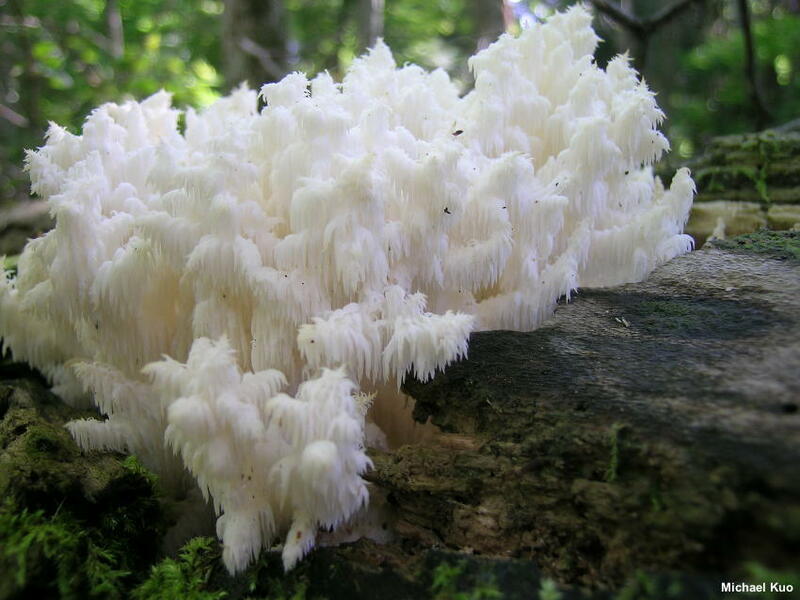 In older treatments Hericium coralloides will be found as "Hericium ramosum" and, confusingly, Hericium americanum will be found as "Hericium coralloides." Ecology: Saprobic and possibly parasitic; growing alone or gregariously on fallen hardwood branches and stumps; late summer and fall, or over winter and in spring in warmer climates; apparently widely distributed in North America. 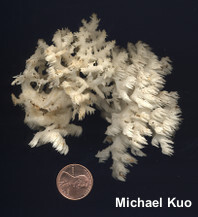 The illustrated and described collections are from Illinois, Michigan, and Québec. Fruiting Body: 8–20 cm across; consisting of branches arising from a more or less central core that is attached to the wood; branches 0.5–1 cm thick, smooth, adorned with fleshy spines; spines 0.5–1 cm long, up to 1 mm wide, white when fresh, becoming faintly yellowish to brownish in old age. 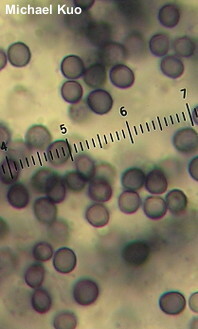 Microscopic Features: Spores 3–4 x 3–3.5 µm; globose; smooth or minutely roughened; hyaline and uniguttulate in KOH; amyloid. 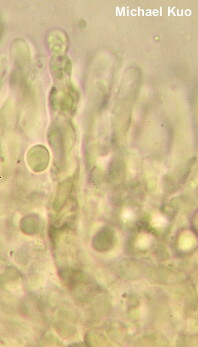 Gloeoplerous hyphae present, sometimes extending into hymenium to become cystidia (up to 40 x 5 µm, cylindric with knobbed apices, smooth, thin-walled). REFERENCES: (Scopoli, 1772) Persoon, 1794. (Fries, 1821; Saccardo, 1888; Harrison, 1973; Smith, Smith & Weber, 1981; Ginns, 1985; Arora, 1986; Phillips, 1991/2005; Lincoff, 1992; Metzler & Metzler, 1992; Stalpers, 1996; Barron, 1999; McNeil, 2006; Kuo, 2007; Kuo & Methven, 2014.) Herb. Kuo 09280304, 09120803.